To toast, or not to toast? Whether you call it a toastie, a jaffle or if you’re an Aussie child of the 80’s, a Breville, you can’t beat a cup of tea and a toasted sandwich on a cold, wet winters day. What is it about the humble ham and cheese sandwich, which when toasted, becomes a little bit more gourmet? A little bit more delicious? Cheese in the centre, so EXTREMELY hot, that you burn your tongue so badly, that you can’t taste anything for a week. So good! So very good! This makes me wonder, do people make these hot deliciously tasty goodies all around the world, or is it only here? And more importantly, what is your favourite filling? we call them grilled cheese here in Canada. I like to run to the garden and pluck a sprig of rosemary and tear it into bits and toss it in - makes it super yummy. We had them today for lunch, ham cheese and salami is our sons favourite. Steve likes ham cheese and tomato, got to watch the tomato as well it gets very hot, me I like a mixture sometimes just cheese sometimes the lot. I've got three more blogs to read then I'm off to the kitchen to make myself a toasted cheese and tomato sandwich! Yummo! Oh YUM!! You have totally got my tummy rumbling!!! I didn't realise the time (past lunch now) until I read this post - I Love a good toastie, and so does my daughter! DD loves ham and cheese, I love adding a little hot salami to give that extra bite! We make em in Indiana and I fill mine with fresh mozzarella cheese and sun dried tomato pesto! 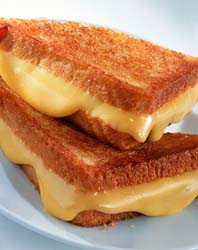 A grilled cheese sandwich was my favorite food as a child and is still a go-to comfort food. My SO is British and calls it cheese on toast. I made the kids and I grilled cheese sandwiches for lunch just today. Yum! With ketchup, of course!! Cheese, tomato and onion toasted sandwich ... scrummy! As a child we had cheese on bread, placed in the coal range oven until the cheese ran, then sprinkled it with cayenne pepper [just sprinkled!] have never seen the same anywhere else. Yum - I like pineapple in there too, good old tinned pineapple, not fashionable but I don't care I love it. Definitely...TOAST. I like ham or chouriço in my toasts. I love canned spagetti and cheese, but with the modern flat plate sandwich makers all the fill comes out. They are best with a Jaffle. We make them here, cheese and onion is my favourite, we call them toasted sandwiches and the French call a ham and cheese toasted sandwich a Croque Monsieur!! definitely refried beans and cheese, yum, in fact i think i know what i'm having for lunch now. I did once know someone who used to do an all day breakfast version, with egg, mushrooms, tomatoes and occasionally some baked beans too, it worked better than you'd think. I'm glad I'm not the only one who refers to them as a Breville. My family had a big orange 4-up one but nobody else I speak to as an adult seems to know what I'm talking about. As for fillings... I really love (in this order from bottom to top) ham, mashed/creamed egg, 'plastic' cheese. It can't be nice good quality cheese, has to be 'plastic' cheese so that the cheese all melts into the egg! Oh yes, we do. We just call them differently. In Switzerland we call them croque monsieur. MMMM! Grilled cheese! I like to add sliced tomatoes in mine. Makes it soooo yummmy! Maybe I'll have one for breakfast. I love jaffles! My favourite topping is cheese and egg! but I also like to add some hungarian salami sometimes too. My kids love them too - which is great! Guess I'll be having a grilled cheese sandwich for lunch here in Texas. My DH likes ham and onion in his grilled cheese sandwich. A friend in Colorado calls them "Corner sandwiches" because they're the only ones she cuts corner to corner. Ham, tomato and cheese is a fave here. Always burn my tongue on the tomato though because I don't wait for it to cool! I live in South Africa and also looooove toasted ham and cheese yummy now what will I have for breakfast this morning!!!!! Yes right toasted ham and cheese. We make them here in the Netherlands too. The classic ham and cheese is irresistable but the variety is endless! Very nice way to get rid of old, stale bread too.